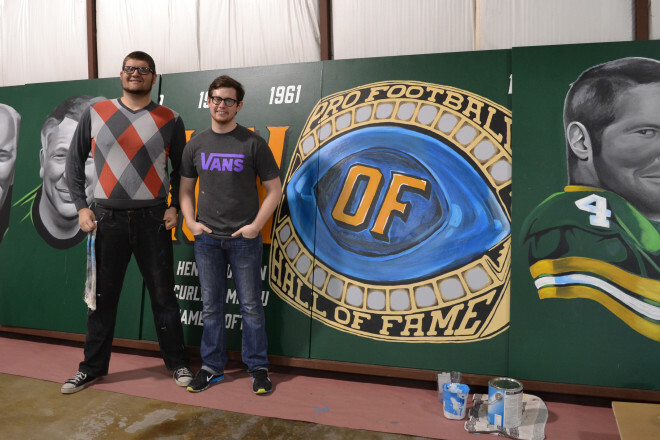 Spencer Young, left, and Sturgeon Bay native Zane Statz stand before their work-in-progress Legends of Lambeau mural. Photo by Alyssa Skiba. Sturgeon Bay native Zane Statz knows how important exposure is in the art world. So when the opportunity arose for him to put his artistic mark on a neighborhood fence passed by 78,000 people on select Sundays in Green Bay, he jumped at the chance. His task? 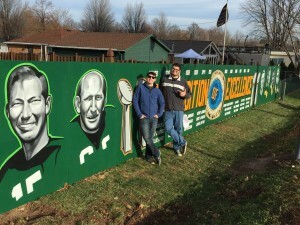 Design and paint a Green Bay Packers-themed mural on a 70-foot-long picket fence located a block off the stadium’s main drag, Lombardi Avenue. The fence would remain up for the entirety of the 2015-16 season and though privately owned, would face the street, helping usher in tens of thousands of local and visiting fans to Lambeau Field. 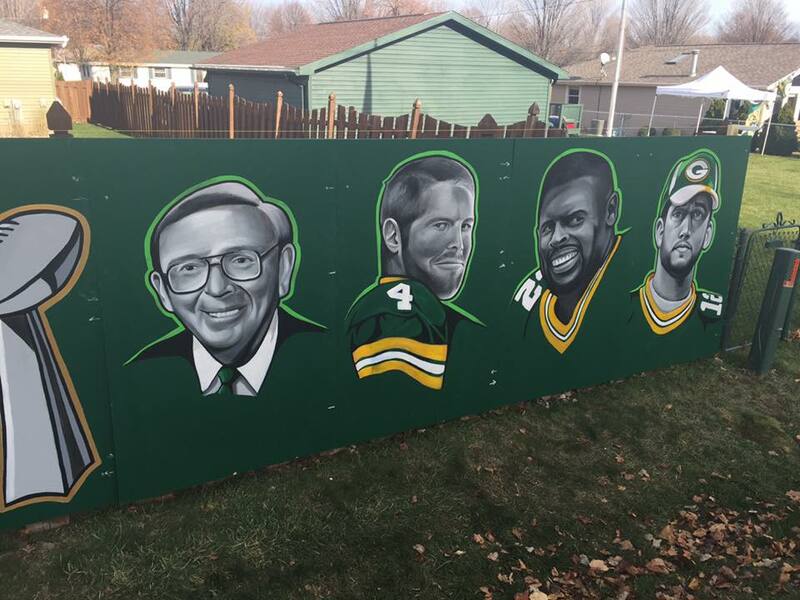 The popular Hulk Lacy fence in Green Bay. Submitted photo. Due to the size of the project, Statz (owner of ZAS Designs) told the fence owner he would need a second pair of hands and turned to his friend, fellow St. Norbert’s College graduate and graphic artist Spencer Young, owner of Forever Young Designs in Black Creek. “I do murals for a living so it was perfect that he called me,” Young said. Little did they know the fence would be the deciding factor in being selected as the winners of a Campbell’s Chunky Soup sweepstake to meet Eddie Lacy at Lambeau Field. “Halfway through the process of painting Eddie Lacy, I posted it on Twitter,” Young said. “…One of my friends tagged Eddie Lacy in the image and the next thing you know, Eddie Lacy retweeted it and said, ‘This is mad cool.’ And then we met him [Nov. 2] and introduced ourselves as the people who did the fence. It was crazy. But that wasn’t the end of the payoff for Young and Statz. Just a few weeks after unveiling the fence, a man who lives nine houses down from the Lacy-Hulk fence contacted them. He, too, wanted a fence to amp up the Lambeau Field neighborhood’s public displays of affection for its home team. The two men were back at the drawing board and within weeks, had an intricate design planned. It would honor the team’s tradition of excellence by featuring eight portraits of the franchise’s legends, a listing of its Hall of Famers, and a Hall of Fame ring. For more than a week, the two painted the design on 17 medium density overlay (MDO) panels spanning 68 feet – Young working on the portraits and Statz working on the lettering and ring. On Nov. 14, less than two weeks before Brett Favre’s Thanksgiving day retirement ceremony at Lambeau Field, the fence was installed. Naturally the two are hoping for a repeat of their Lacy meeting, albeit with the newest inductee to the Green Bay Packers Hall of Fame. Regardless of if they meet their childhood hero, the two are certain that their futures are brighter thanks to the popularity of their fence murals. 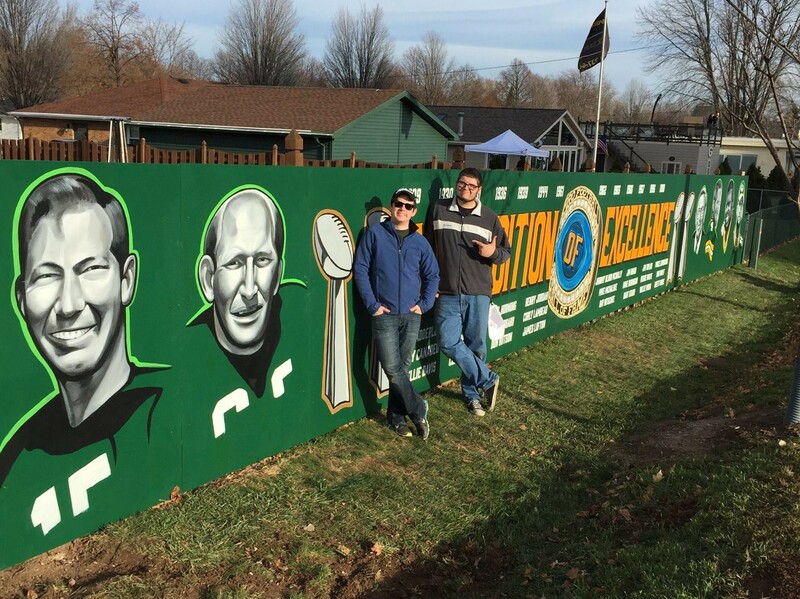 The final Legends of Lambeau fence mural in Green Bay, created by Zane Statz and Spencer Young. Submitted photo. For more on the artists’ individual businesses, find ‘Forever Young Designs’ and ‘ZAS Designs’ on Facebook or visit ZASDesigns.com.